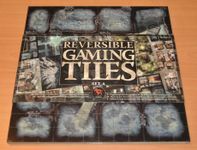 These Reversible Gaming Tiles have been designed by Nicolas Fructus (who illustrated the Hybrid game boards) following the plans of the makers of the Cadwallon RPG. This sets of 15 reversible tiles covers the city’s lower alleyways and exploration zones as well as indoor locations. Outdoor tiles offer reversible locations for both day and night gaming while the indoor tiles offer up different locations on each side. Each square measures 2.5 x 2.5 cm and each tile measures 30 x 30 cm. These tiles have been scaled for 25/28mm miniatures.